For information regarding GPA please check GPA section. GPA reflects your existing grades in US grading format (actually widely used in many countries). Most US universities have the tri-semester system - the fall, spring, and summer. Each semester is around four months. This is the first semester of the year, which starts mid-August and is less often called the autumn semester. The academic year begins in this semester, and most aid and assistantships are offered during this period. Moreover, most new intake is during this period. Classes begin around the first or second week of January. Most universities (say 85%) admit new students during this semester, but the student intake is less compared to fall. The chance of aid is lesser, but other on-campus part-time jobs are available year round, good enough to take care of your living, accommodation and personal expenses. Some universities call this the winter semester. This is the shortest of the three semesters and spans for two months and usually, starts in June. Very few universities have summer intake. Although the university, on the whole, may have summer intake, make sure the department accepts new students (this applies to spring as well). In several cases, regular students do not enroll for this semester and work full-time on campus (40 hrs/week) or take up industrial training. This is mostly applicable to MS students. A thesis option requires taking up a thesis, and at the end of which, a dissertation (should have a genuine or original idea) has to be presented and defended orally. This is a must for students enrolling to masters programs leading to a doctorate (Direct doctorate after under graduation). It is advisable for students having a desire, to pursuit up to doctorate level at a later stage, to choose this option. 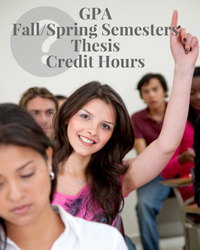 Non-thesis option typically requires a project to be completed by the end of the course. Student's opting the project option on an average graduate in 4 semesters (1.5 years), and with a thesis option it takes on an average two years, with exceptions in both the cases. The US system usually allows a student to choose papers (apart from some mandatory essential papers) And each paper will carry a certain number of credits say 3 or 4 (in the case of a project it would be 5 or 6). When the student full fills the required number of credits; he or she graduates. In most universities, this requisite is 30 to 36 hrs for Non-thesis (usually carries a project) option. But for the thesis option, this requisite is much lesser, but with a thesis work to be presented. Graduate degree is equivalent to Masters or Postgraduate degree (In most cases it takes 2 years to complete). Undergraduate degree is BS/Bachelor degree. Thesis standards established by the University. In US they are completely different departments (in most cases). Computer Engineering has more focus on hardware and Computer Science has more focus on software. In some countries CS and Computer Engineering is same. If you are focusing on software career CS is the degree you need to take.